Escaping the winter weather is always attractive but, for many, escaping the commercialism of Christmas is even more important. 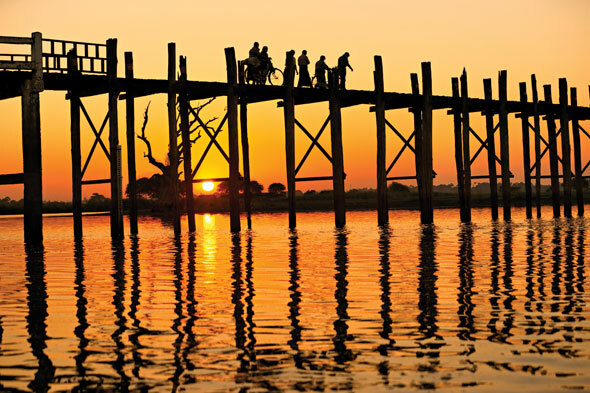 A cruise on the Irrawaddy River does both and makes for an unforgettable experience. There are golden pagodas, temples and giant Buddhas in many of the towns and villages along the river or just a coach ride away, while British colonial buildings remind us of our own country’s involvement in beautiful, but complicated, Burma – or Myanmar, as it is now known. Paukan Cruises operates between Mandalay and Yangon (formerly Rangoon) on the Irrawaddy, with downstream cruises from Yangon heading to Prome to see the Shwesandaw Pagoda complex, an important Buddhist pilgrimage site. There are old colonial houses in Thayetmyo and a pagoda built from gold bricks in 1929 at Myat Than Lun Paya. The cruise includes many more extraordinary cultural sights, such as the 19th-century teak monasteries in Salay and the Shwebadaung caves with hundreds of Buddha statues and paintings dating back to the 14th century. However it’s also about visiting the local markets; for instance in Bagan you can buy wood carvings, fabrics and rattan products. Or you can hire bicycles to explore on your own, or just sit and watch the sun set in astonishing surroundings. Paukan’s river boats are traditional but luxurious, with colonial-style decor in a luxury boutique hotel arrangement. The dining room serves a mix of Eastern and Western cuisine, the sun deck has a stage for cultural performances and the wickerwork furniture of the bar gives it the feel of an Agatha Christie novel.